Bond prices have slumped since Bernanke told Congress’s Joint Economic Committee on May 22 the Fed could scale back stimulus efforts “in the next few meetings” if the employment outlook shows “sustainable” improvement. He stressed that any decision would depend on what the economic data showed and that a move to reduce the pace of purchases would be delayed if recovery falters and inflation falls further. This is very compelling narrative, except that it is probably wrong. This popular view is so caught up in what Bernanke said that it is missing the forest for the trees. 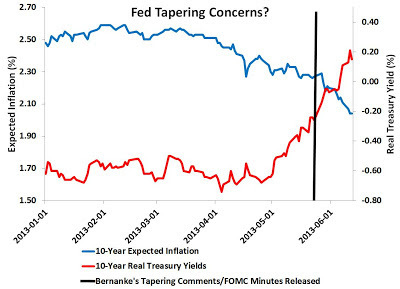 Other developments have been happening to long-term yields that suggest the tapering talk is a red herring. These can be seen in the next few figures. Second, as noted by Jim Hamilton and Michael Darda, long-term interest rates on safe sovereign assets around the world are going up and are doing so in a similar manner. 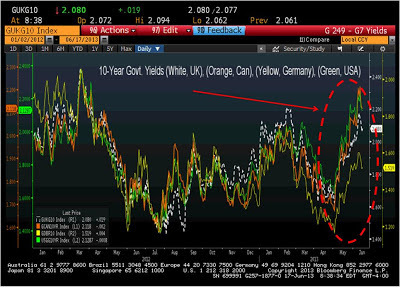 So whatever is affecting U.S. long-term interest rates is also affecting global yields. 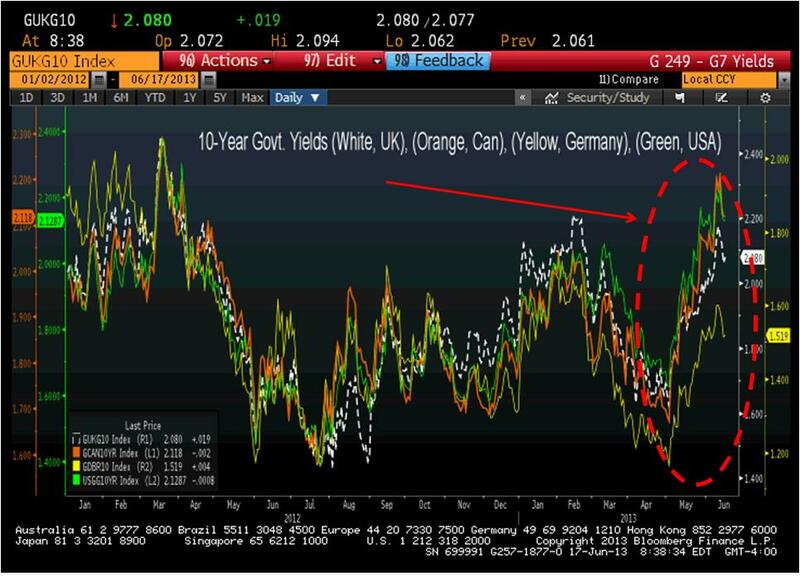 So what could be affecting all these yields over the past few months? How about an improved economic outlook? We are now halfway through 2013 and the U.S. economy has been relatively resilient to fiscal austerity and Japan's first quarter growth has been better than expected. Maybe investors see these developments and are becoming increasingly more confident. If so, they would be rebalancing their portfolios accordingly and, in the process, driving up the natural rate of interest. This possibility is a point that Market Monetarists like Lars Christensen have been making for some time. Earlier this year, Chairman Bernanke made the point that rising interest rate reflect “The fact that interest rates have gone up a bit is actually indicative of a stronger economy,” Bernanke said in Washington today in response to questions from members of the House Financial Services Committee. That indicates the Fed’s stimulus is working, he said. 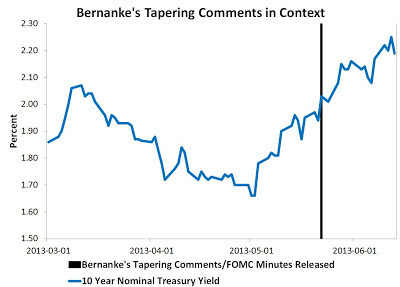 It also means that most observers have misinterpreted Bernanke's remarks on tapering. For him to even consider tapering implies he believes a solid recovery may be finally taking hold. But, by his own admission, a solid recovery means higher interest rates. 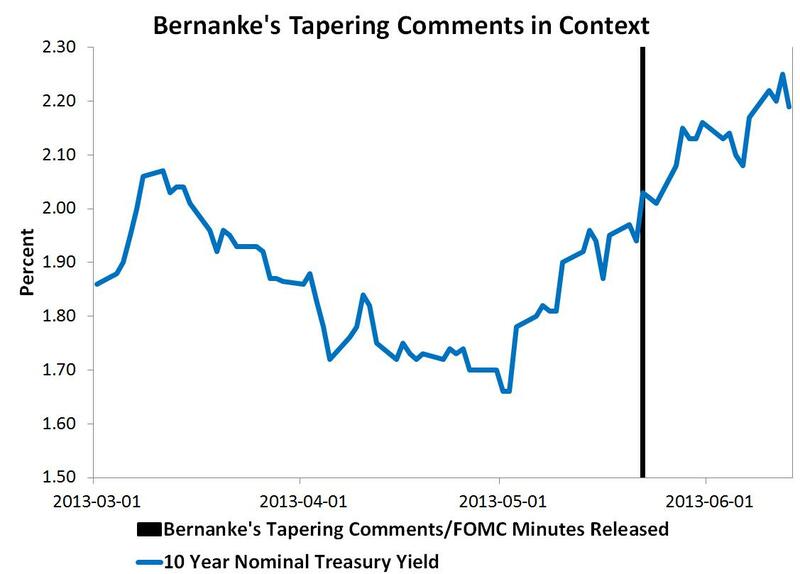 Commentators, therefore, should be viewing his tapering talk and higher yields as a sign of progress, not as a sign of Fed tightening. Here too there is a benign explanation for these developments: a positive supply shock. As Ryan Avent explains, there appears to have been some growth in global productive capacity. One example would be the increased oil production in the United States. Positive supply shocks like this tend to put upward pressure on the natural interest rate and downward pressure on inflation. If this assessment is correct, then we need not worry about the declining inflation as noted by Lars Christensen. Of course, the U.S. economy is a long way from full employment and the short-term natural interest rate may still be below zero. But these developments should give us pause and force us to recognize that once a strong recovery takes hold, we should eagerly anticipate rising interest rates. Embrace the rates! P.S. Count this post as my long-overdue second part of my Bernanke Friday Night Special Part I.
Marcus, I am ever the optimists! Seriously, though, my sense was that the May 1st press release statement was not negative but a positive when it said "The Committee is prepared to increase or reduce the pace of its purchases...". Wasn't this viewed as signalling the Fed may actually increase asset purchases if needed given the fiscal drag? Many of the news stories back had this spin. The natural rate of interest should normally be rising at this stage in the business cycle. But the liquidity of consumer demand is still so weak that the natural rate is shaky. There is a principle in medicine… Every medicine is a poison if taken beyond the safe dosage. Supply-side is a good medicine if taken properly, but be careful it is not taken so much that it becomes a poison. At some point, labor income must rebound. Also the natural rate of unemployment may have risen to 7%. A higher natural rate of unemployment would mean a downward shift of the natural rate of interest. Edward, I agree this far into the slump that natural rate may have risen slightly. Only, though, because we allowed the cyclically employed to become structurally employed. If QE3 was really working, money growth would be higher than 7% and inflation expectations would be rising, not falling. The monetary base is irrelevant. 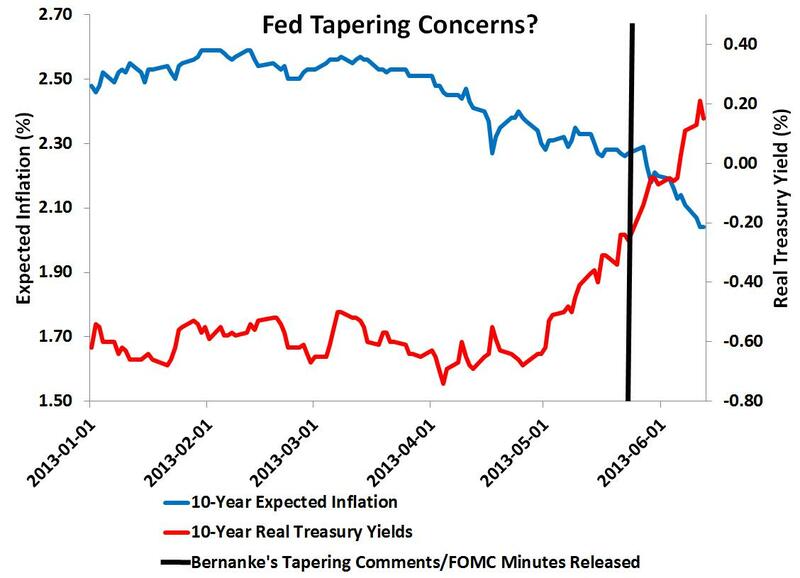 Forget tapering down, The Fed should be tapering up. Like any public agency, the Fed is ossified. It is fighting the last war, the one on inflation. The USDA is helping Dustbowl farmers, and HUD is rebuilding center cities, and Defense is fighting a huge Cold War enemy…well, er, a few punk terrorists. Public agencies fall in love with their exalted rhetoric, and come to believe their goals are nearly divine. The Fed genuflects to 2 percent inflation, and thus starts to tighten anytime inflation gets above 1.5 percent or so. See Japan for how tight money works when a nation is in a recession. You know what is really nuts? Suppose I said I have “Policy X” and that with this policy we will get 5 percent real growth and 5 percent inflation for five years. That would be boom times in America, btw, for business, profits and workers. Fat City. The the national debt to GDP ratio would start to go down. True statement. Think about it. The Fed has become a menace to prosperity. Since when has anyone relied on Bernanke's forecasts? Big Ben forecasted unicorns and gumdrops heading into the Great Recession. Now he supposedly has his finger on the pulse? I wouldn't bet on it. USGG5Y5Y suggests the Fed will start getting antsy about disinflation very soon. Interventionsim is the rule of thumb until somebody breaks the cycle. Bernanke is not going to break that cycle. Is the Fed Squeezing the Shadow Banking System?